Gatorland®, the “Alligator Capital of The World,” has announced a special offer of $49.99 per person for its Screamin’ Gator Zip Line when booked online on its website by Aug. 27, 2017 for reservation dates through Dec. 15, 2017. That’s a $20 savings off the regular price of $69.99 per person. Online payment must be made at time of booking. 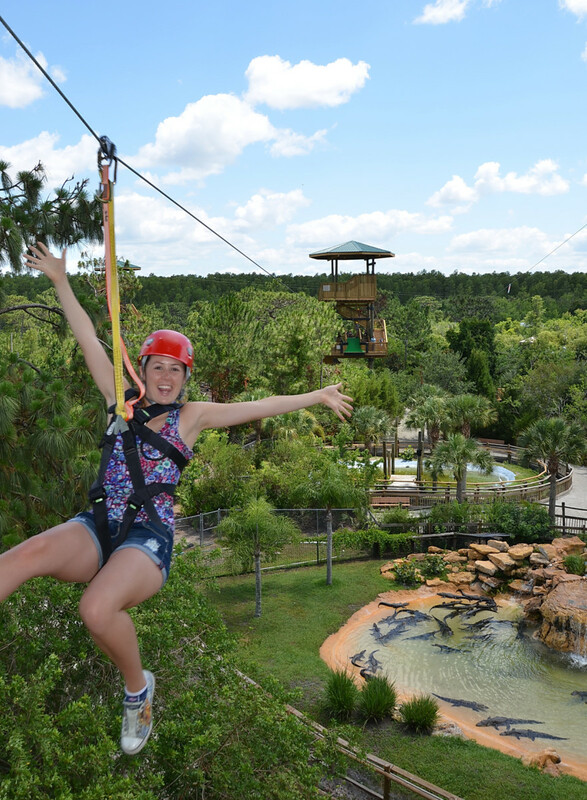 The Screamin’ Gator Zip Line has been rated Top Zip Line in the USA by AOL Travel and features a breathtaking journey along 1,200 feet of high flying adventure from platforms designed to replicate the Breeding Marsh Tower. At heights up to 56 feet, guests will fly at speeds near 30 miles per hour through the park. The Screamin’ Gator Zip Line at Gatorland carries riders in length from 230 feet to more than 500 feet over some of the most exciting exhibits. On just the second leg of the journey, adventurers soar above the theme park’s collection of jumping Cuban Crocodiles. Next is a bird’s eye view of the Alligator Breeding Marsh with more than 150 giant alligators. The 45-minute experience includes a brief orientation session, a nature walk through the swamp, five breath-taking zips and an exciting 150-foot swinging suspension bridge. Participants must be at least 37″ tall and weigh no more than 275 lbs, and must fit safely into the zip line harnesses (Guests may be required to weigh in at time of participation). The Screamin’ Gator Zip Line traverses numerous public walkways and animal exhibits. For the safety of the animals and park guests below the zip lines, cameras, cell phones, video equipment including GoPro™ HD cameras and other personal items may not be taken on your adventure. Secure lockers will be available for storing your belongings. Guests will be required to sign a Release, Liability Waiver, and Consent Agreement prior to their launch. Minors under the age of 18 MUST have a Liability Waiver and Consent Agreement executed and signed by a parent or natural guardian. To book your Screamin’ Gator Zip Line adventure today, go to http://www.gatorland.com/public/experiences/screamin-gator-zip-line/index.cfm. Coming Fall 2017 are the brand-new Gator Joe’s Adventure Outpost and Stompin’ Gator Off-Road Adventure, the largest park expansion since Gatorland first opened. The new Stompin’ Gator Off-Road Adventure runs alongside the swamps that feed the headwaters of the everglades. Each of the three monster-style, off-road vehicles seats 12 riders, plus the driver, and is decorated to represent iconic alligators and crocodiles in Gatorland’s rich history. The new Gator Joe’s Adventure Outpost will be located in front of the Stompin’ Gator Off-Road Adventure and serve as the park’s home base for reserving and purchasing separately-ticketed park adventures including the Stompin’ Gator Off-Road Adventure, Screamin’ Gator Zip Line, Adventure Hour, Gator Night Shine and Trainer For The Day.